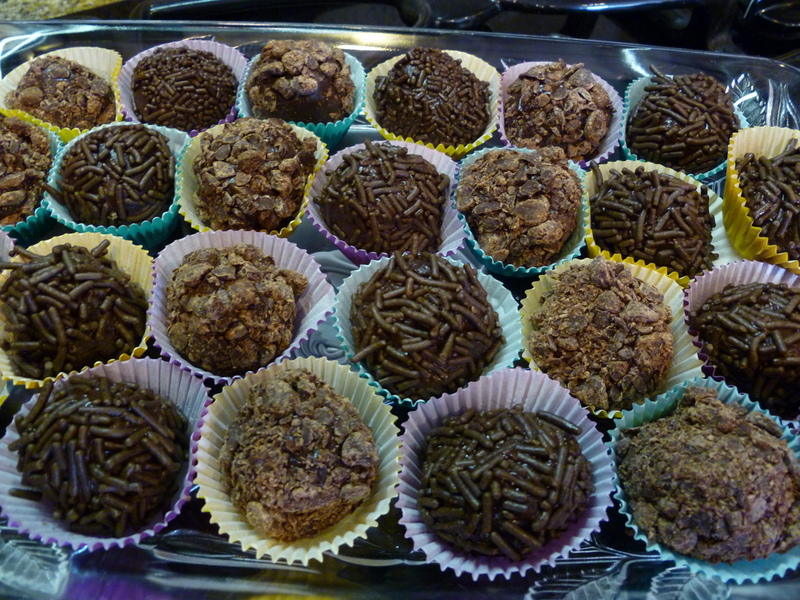 Also known in Brazil as “Brigadeiros” or as my family likes to call them “Brazilian Fudge Balls”. They are very popular in birthday parties but great in any occasion and widely available in any bakery, coffee shops and pastry shops over there. The original recipe is a simple mixture of condensed milk and cocoa powder then rolled on chocolate sprinkles. I changed the recipe a little by using dark chocolate bar and rolling truffles on finely shredded chocolate chips. A few years ago it was difficult to find chocolate sprinkles and even now if it is not Valentine’s season you can maybe find a small container and it is expensive. I find that shredding your own chocolate instead of sprinkles also makes them tastier. The picture you see in this recipe has truffles rolled on sprinkles and on finely shredded chocolate chips. Enjoy!! 8 Ounces Dark Chocolate broken into small pieces. 1 Can Condensed Milk ( I like to use the fat free ). 8 Ounces Chocolate Sprinkles or 12 Ounces pkg Semi Sweet Chocolate Chips. 24 Mini Cupcake Paper Molds. 1) If using chocolate chips set them in freezer. 2) Melt butter and dark chocolate in bowl or pan in a water bath over medium heat. Stir constantly until thickens. It is ready when you see the button of the pan. 3) Remove from water bath and pour chocolate mixture in a glass bowl and let it cool for about 30 minutes. 4) Once cooled cove with a plastic wrap and set it in refrigerator for at least 1 hour. 5) Remove fudge from refrigerator. Pour chocolate sprinkles on a plate. If using chocolate chips, remove it from freezer and chop them in a food processor using a shredder blade and pour it on a plate. 6) Use a tsp to scoop fudge or a cookie dough scoop, shape them into balls using the palms of your hands, then roll them on chocolate sprinkles or shredded chocolate chips. Place them in mini cupcake paper molds arranged on a platter. Keep them refrigerated!